The Pinebook will soon launch as a laptop alternative to the Raspberry Pi for $89. Pine64 launched an alternative to the popular Raspberry Pi last year, based on an Allwinner A64 ARM-CPU. Now they announced two laptop versions and called them Pinebooks. They will be available starting at $89 and run both Android and Linux. If all you need is a cheap Linux laptop without fancy specs, Pine64 might have something in store for you. The creators of the PineA64, a single-board computer similar to the Raspberry Pi running a 64 bit Allwinner A64 processor based on ARM Cortex-A53 cores are preparing to release two laptops based on the same board, together with cheap netbook style hardware. 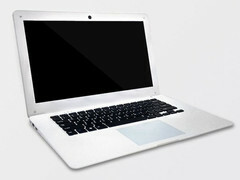 Compared to regular notebooks, the Pinebooks will be way cheaper. The 11 inch version will go on sale for $89, the 14 inch version will set you back $99. So far no shipping dates were communicated but you can register to be notified when Pine64 is ready to ship them out to you. Both versions of the Pinebook share identical specs except for the display size. The IPS-LCD display will have a resolution of 1,280 x 720 pixel. Like mentioned above, an Allwinner A64 64 bit Quad-Core processor will be integrated together with 2 GB of LPDDR3 RAM and 16 GB of eMMC 5.0 storage, which can be expanded up to 256 GB via Micro-SD-Slot. There will also be two USB 2.0 ports as well as Mini-HDMi and an audio jack. Single Band WiFi up to 802.11n and Bluetooth 4.0 will be integrated as well. The Pinebook will carry a 10,000 mAh battery. We are not sure if the specs (352 x 233 x 18 mm, 1.2 kg) regarding size and weight on the Pine64 website are correct because there is only one set of data for both versions. The Pinebook will be able to run Android and various Linux distributions that were adapted for the PineA64 like Debian, Ubuntu or OpenSuSe. Chrome OS is also being adapted so you might be able to build yourself a cheap Chromebook.